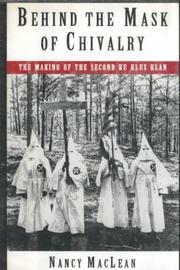  A well-researched and convincing analysis of the most powerful reactionary movement in American history: the Ku Klux Klan of the 1920s. Dormant since the end of Reconstruction in the 1870s, the Ku Klux Klan broke out with an even more virulent strain of terrorism in 1915. Yet, as MacLean (History/Northwestern) demonstrates, it did not really hit its stride until after WW I, amid social disruptions ``that appeared to eviscerate discipline, stability, and predictability.'' MacLean is less interested in the organization's use of terror (though the few incidents she recounts are horrifying enough) than in the frightened worldview of its members. She takes issue with the common depiction of its rank and file as ``poor white trash,'' instead identifying the typical Klansman as a solid family man who found the settled certitudes of his life under a multipronged assault from changing relations between the sexes, Prohibition violations, strikes, and civil rights agitation. Such men, threatened by concentrated wealth above and labor insurgency below, felt as unmanned in the workplace as they did in the home. With between one and five million members at its height, the Klan was so powerful that no president in the 1920s dared to denounce its violence against African-Americans, Roman Catholics, Jews, and union activists. MacLean focuses on Clarke County, Georgia, where the Klan's Athens chapter left a cache of records surprisingly rich for an organization so famed for secrecy. At the same time, she carefully anchors this local study in a larger international perspective that takes in the post-World War I reactionary movements that produced fascism and Nazism. Masterly scholarship that unravels the murderous racial, gender, and class resentments underpinning a terrorist organization as American as apple pie.